Experienced fishermen can bring home a rather large haul. What to do with so many fish? Try to pickle it using spicy Ambassador. It will be a great appetizer on the dinner table. Prepare the fish to the Ambassador. If you use freshly caught river fish with a weight of 200-1000 grams, the gut and even more to freeze it should not be. It is best to pickle the fish entirely. Prepare a bowl for salting. In this case the most suitable is a deep bowl or stainless steel pot or an enamel-coated. You can use plastic food containers. Lay the fish in layers. Put down the larger specimens, and the little leave on the upper layers. Lay the fish in such a way that the head lay to the tail. Pour each layer with a mixture of salt and coriander. Add a few peas of black pepper and 1-2 Bay leaves. Keep salt was covered with each fish. Close the bowl with a lid smaller wooden round or flat plate. Put the oppression. It is possible to use a large jar filled with cold water, heavy stone or other object. Put the dishes with fish in a cool room. After a few hours, usually 10-12, the fish will give the juice (brine). Don't drain it until after the salting. Remove oppression in 3-4 days. Drain the brine and rinse the fish in cold water. 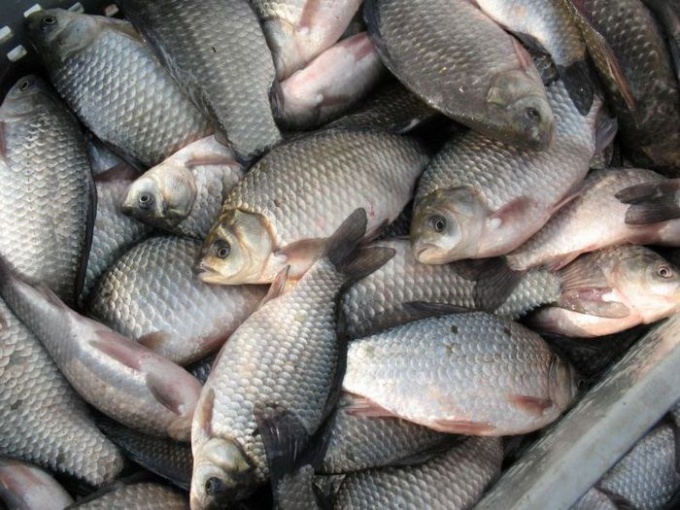 Pour the entire fish with cold water and leave for 1 hour to vymachivanija. Let the water drain out. On a flat surface spread several layers of newspaper. Lay on top of towels. Lay the fish so that the individual instances do not touch each other. Dry for 2 hours on each side. If you need Newspapers and towels change. Store fish in the freezer, refrigerator or cold room. Use for salting coarse salt. Because it dissolves slowly, pulling the moisture from the fish. And the process of salting lies in the substitution of the water in fish tissue salt. Fine salt, this effect can not give. Salting the fish better in the spring or winter. The fact that prior to the laying of eggs, its meat contains more fat and therefore has a more delicate flavor.